BRIAN WILLIAMS, anchor: Now we turn overseas to Pakistan and that deadly attack over the weekend by US troops that killed at least two dozen members of the Pakistani military . And now it's created a huge mess in the US relationship with Pakistan , a nuclear nation, don't forget, that's key to the US war effort in Afghanistan . By the way, a war on which we spend roughly $2 billion a week. There are new details tonight, still a lot of questions about what went wrong. Our own Jim Miklaszewski on duty at the Pentagon tonight. Hey, Jim , good evening. JIM MIKLASZEWSKI reporting: Good evening, Brian . US officials tell NBC News that before launching those deadly airstrikes, American commanders got permission from the Pakistani military to go ahead with the attack. But now the US military is looking at the possibility that American forces may have hit the wrong targets. MIKLASZEWSKI: Pakistan 's military and government leadership gathered for a mass funeral in Islamabad to mourn the deaths of the 25 Pakistan soldiers killed in the US airstrikes, while violent anti-US demonstrations exploded across Pakistan . The White House tried desperately today to ease still another round of growing tensions between the US and Pakistan . Mr. JAY CARNEY (White House Press Secretary): The president's reaction is all of our reaction, which is that the events that took those lives -- the event, rather, was a tragedy. MIKLASZEWSKI: The Pakistanis claim the attack was unprovoked, but US military officials insist the Americans were acting in self-defense. They claim that early Saturday, rockets were fired from Pakistan at American and Afghan forces across the border in Afghanistan . The Americans called for air cover and US helicopter gunships attacked two separate outposts, killing the 24 Pakistani troops. Pakistan quickly retaliated, cargo trucks stacked up at the Afghanistan border today after Pakistan shut down the critical supply line that provides American forces with 40 percent of what they need to fight the war. General BARRY McCAFFREY, Retired (NBC News Military Analyst): This has put us in one step short of a strategic disaster. We simply can't operate without at least 50 percent of our supplies that come through Pakistan on the ground and are now held up. MIKLASZEWSKI: It's just the latest in a series of clashes between the US and Pakistan , including the US raid that killed Osama bin Laden that potentially threatened the entire US war effort in Afghanistan . Joint Chiefs Chairman General Martin Dempsey knows exactly what's at stake. General MARTIN DEMPSEY: So is it serious? Absolutely. Are we taking it seriously? I can promise you that. I don't know how it'll turn out. come at a heavy price. Brian: Jim Miklaszewski . Great work at the Pentagon tonight on a big story for this country. 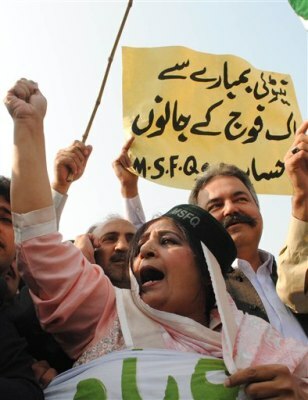 A Pakistani woman joins others to condemn NATO strikes on Pakistani posts, in Peshawar, Pakistan on Monday. The NATO airstrikes that killed 24 Pakistani soldiers went on for almost two hours and continued even after Pakistani commanders had pleaded with coalition forces to stop, the army claimed Monday in charges that could further inflame anger in Pakistan. A placard reads "NATO is responsible for the loss of Pakistani soldiers."